Automobile Suspension Design 101 (Part I): What Is A Suspension? To most people, the meaning of suspension systems are: something that can absorb unevenness of the road surface, which makes it comfortable to ride in the car. Although this description is correct to an extent, it is a quite shallow understanding though. There are much more interesting facts that we can explore. First let’s go to the root of the topic, we look at the car’s wheel hub: assume there is no restriction/connection to the wheel hub, which means it is a totally independent object to the car body, what property will it have? The answer is: the wheel hub will have 6 types of movement, we call it 6 degrees of freedom. Please see the below illustration for example. Basically speaking, we are living in a 3-dimensional space, and we can use a X-Y-Z coordinate to pinpoint any location. 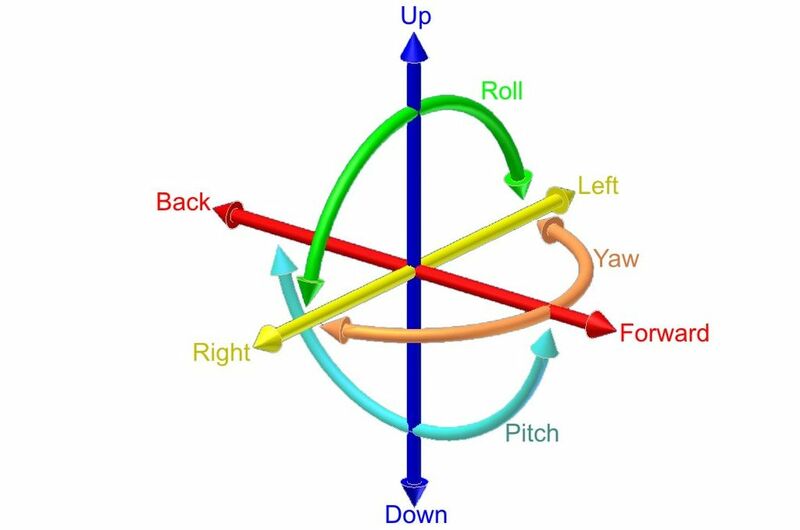 The 6 degrees of freedom can be described as: movements in the (1) X-axis direction; (2) Y-axis direction; (3) Z-axis direction; rotations within the (4) X-Y plane; (5) X-Z plane; (6) Y-Z plane. For an automobile’s suspension – the wheel hub to be exact: we only want it to have only 1 degree of freedom. Why? Suppose a car’s suspension has 2 degrees of freedom. That means that this car is uncontrollable because the wheel hub will move independently in two different directions. For example, when you are driving over a speed bump, the car will not only bounce up and down (which is normal), but also shakes forward and backward randomly – would you want to drive this car? Didn’t think so. So we must control the degrees of freedom. By saying “control”, it does not mean fixing the 5 degrees of freedom (not allow they move) out of the total 6. Here the “control” means by using control arms, which connects the wheel hub to the car frame, to make different types of movements be depend on each other. They can still change, but not freely anymore, one direction change will forced others to change too. A simple example: two numeric variables p and q, they have a 2 degrees of freedom together. Now we introduce one control: p + q = 10. With this control, p and q are not fixed at all, but the change of p will caused q to be changed too. So the system now only has 1 degree of freedom. Generally speaking, one independent control arm can limit 1 degree of freedom; so to get 1 degree of freedom for the suspension, we need a total of 5 control arms (6 – 5 = 1) . This is the reason why some car models’ suspension specification is labeled as “multi-link” or “5-link” by their manufacturers. 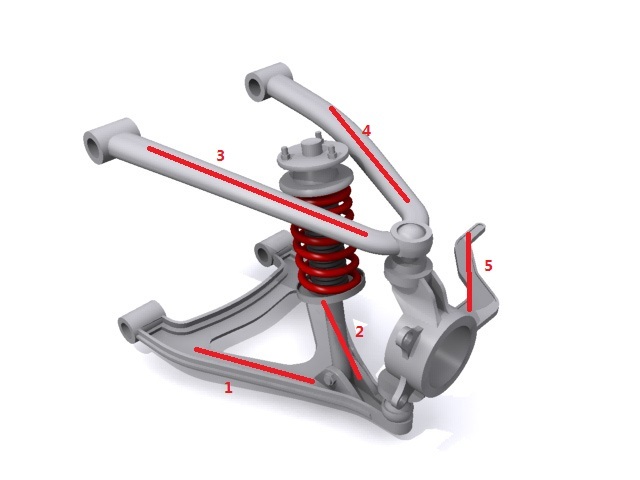 Take the following double wishbone suspension as example, the highlighted 5 structures put restrictions and controls all degrees of freedom (by applying 5 different restrictions), the result is one degree of freedom for the whole system. Someone may ask: why don’t we fix all of the 6 degrees of freedom? That is because with all 6 degrees fixed, it means the wheels are bolted to the car frame directly, then you will feel any imperfection and unevenness of the road surface. Definitely a harsh ride, isn’t it? This is the reason why we never see a “6-link” suspension. Beginning from part 2 of this article, I will start to provide some analysis to the most common types of independent suspension in the auto industry. One comment to Automobile Suspension Design 101 (Part I): What Is A Suspension?